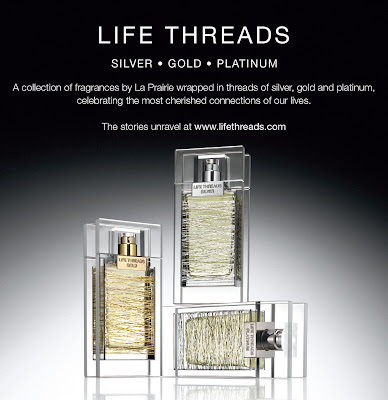 In a fragrance release that is as sumptuous and luxurious as the iconic house that is releasing it, the Life Threads Fragrance collection from La Prairie takes perfumery one step further with a full-on sensory experience that combines smell, sight, touch, and sound. The fragrances themselves unfold to reveal distinct notes that call to the senses, progressing much like the important stages in a woman’s life. Having had the ultimate pleasure of sampling the scents at a recent event, I must say that it was love at first sniff. Known for it’s exceptionally innovative skincare and stunning color collections, La Prairie sought to take the existing line one step further with a trio of fragrances that goes places fragrance doesn’t traditionally venture to. The Life Threads experience goes beyond scent, stimulating other senses such as sight (with video), touch (with beautiful bottles encircled with their namesake threads), and sound (with a distinctively beautiful soundtrack). As for the scents themselves, each one is unique and beautifully crafted. I think of the fragrance trio as a progressive series, with notes in each that call to distinct, fundamental elements of the feminine personality. 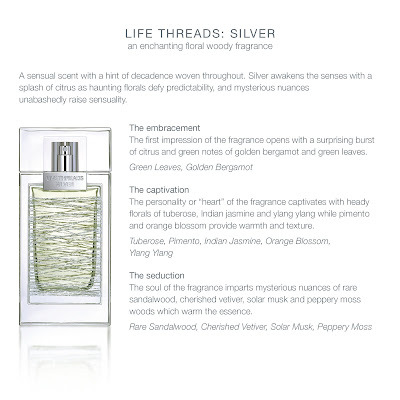 My absolute favorite of the bunch, Life Threads Silver is a sweet floral that is both warm and flirtatious. To me Silver is your twenties. The scent represents that stage in your life where you are simply enjoying life and all of the pleasures it has to offer. You aren’t sure where you are headed, but you are definitely enjoying the ride. The citrus notes provide a burst of energy, while the strong floral notes lend a hint of flirtation. I happily wore this scent all weekend, and received dozens of compliments. 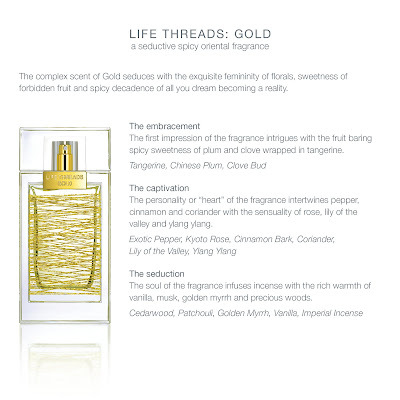 The second fragrance, Life Threads Gold is a spicy floral scent that instantly draws you in and wraps you in its silken embrace. A twist on the traditional citrus floral, the spicy notes add just the right amount of intrigue and mystery. Gold is your thirties, representing that time in your life where you are comfortable with yourself, and confident in your abilities. The Gold woman is ambitious, strong, powerful, and fiercely feminine. 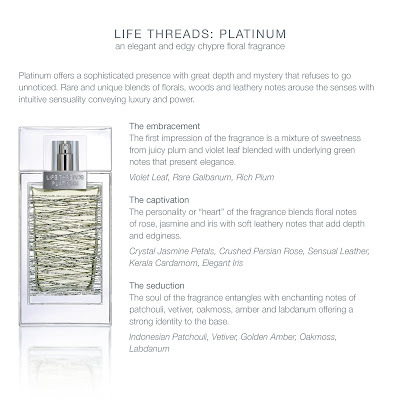 The third fragrance of the collection, Life Threads Platinum is a musky floral. The fragrance personifies assertiveness, sophistication, and elegance. The leather and musk provide the ‘strength’ of the scent, giving the otherwise sweet floral a bit of a kick. This is a scent for a powerful woman, both radiant and confident. To me, this scent was a bit more mature than all the others, yet nonetheless beautiful in both execution and tone. 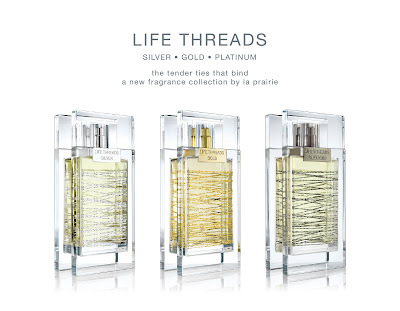 To compliment the release of the fragrances, La Prairie is launching a website on October 1st, appropriately titled lifethreads.com. Providing the visual backdrop of the launch, the life threads site will house a total of nine featurettes that embody and exhibit the very essence of each scent. The first video to launch will be ‘Top of the World’, the embodiment of the Platinum fragrance. 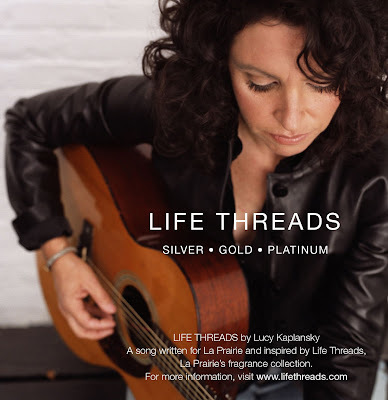 The voice of this launch is none other than soulful songstress Lucy Kaplansky, whose beautiful ballad “Life Threads” provides the auditory backdrop for the launch. Lucy will be touring starting next month, so be sure to check her out at a La Prairie counter near you. Her first appearance will be on October 1st, at Bloomingdales SOHO (504 Broadway) from 5pm-7pm, so don’t miss it! Visitors will receive an autographed CD and the chance to meet Lucy herself with the purchase of any Life Threads fragrance. For tour dates and more information, be sure to check out Lucy’s tour schedule here. I have listened to her album, Red Thread, and it is truly something special.